One of the most important elements needed for the successful removal of cockroaches and other common household pests is a careful and complete inspection of the building, along with proper and continual follow-up procedures. The initial or cleanout treatments to exterminate roaches must eliminate about 95% of the colony for typical ongoing maintenance to succeed in keeping cockroaches away from the property. Because cockroaches are often hidden in an isolated shelter, frequently in hard-to-reach cracks and crevices, about 1/3 of roach nymphs go undetected during the initial inspection, which is why we will then return for a cleanout visit shortly after the first inspection. After our extermination technicians have completed the removal of a cockroach infestation, our Spring-Summer-Fall Power-Spray Program will keep roaches and other common household pests away all year long. 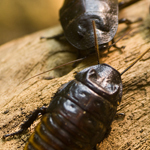 For more information about our cockroach treatments and our affordable annual pest control maintenance program, please give us a call at (317) 888-8111.